It's hard to say if Alice in Wonderland is a very popular fairytale written by Lewis Carroll, or the biggest piece of literally nonsense ever written. What's easy to say is that the book has the power to mesmerize all readers, irrespective of their age. I've read it many times over the years, and I enjoyed it all over again as this month's pick for "This Book Makes Me Cook". Funnily enough, I rarely remember Alice at first when I think of Alice in Wonderland. I always recall Cheshire cat's grin and mad hatter's tea party. And I think of the caterpillar on the mushroom. And the queen saying "Off with their head". It's bizarre, but unforgettably so. It was the memory of the playing card gardeners painting the roses red, and the image of playing cards parading with the king and queen of hearts that prompted me to make my playing cards cake. I haven't had any access to internet and emails for the past three days, but I know some of you have been concerned about my safety. So just wanted to quickly stop here and tell you I am fine. Fine, but scared at the extent of terror in my city. Shocked at the death toll. Sad that the "palace" that symbolized Bombay to me and countless others for the past hundred years is damaged. Cherries are the fruit of choice for November's A Fruit A Month being hosted by Rachel. Where will I find cherries in November, I asked? And Rachel assured me that she would let me use them in any form - canned, preserved or dried. So when my friend turned up for lunch on sunday afternoon and I needed a dessert in a hurry, I converted my trusted berry muffin recipe to incorporate dried cherries I had in my fridge. To make four cherry muffins, mix 100 gms flour with 1 tsp baking powder and 40 gms caster sugar. Set oven to preheat at 200C. Melt 30 gms butter and pour into the flour mixture. Add 1 egg, 1/2 tsp vanilla essence and 50 gms yogurt. Mix well to form a batter, then add a handful of dried cherries. Mix and spoon into four paper lined muffin cases. Top with some more dried cherries and bake for 15 minutes. Cook: What do I make for lunch? Me (sleepy and bleary eyed): Anything. Isn't there spinach in the fridge? Make aloo palak. And leave some dough for me. I'd make rotis. Cook: Okay. I also cut some cucumber for salad. Me (just wanting to go back to sleep): Yeah, whatever! Friend: I'm shopping in the neighborhood. Will pop by in half an hour. Me (To Myself): Is Aloo Palak interesting. NO WAY!!!!!! Which is why I converted aloo palak and cucumber salad to an interesting gourmet lunch. We had my signature mocktail and green salad for starters. Burritos (or something similar) for mains. And while my main course was in the oven, I quickly mixed up the batter for muffins. Ready by the time we finished eating our main course. I am incredibly nervous. Sushi is one of the things I never thought I could make at home. But the closest sushi restaurant that passes muster (in fact, the only one in Mumbai) is a couple of hours drive away which means I have to go without sushi for rather a lot of days. So slowly, steadily, I've put all the ingredients together. I have a tube of wasabi, a pack of nori sheets and sushi rice in my pantry. A bottle of dark soy sauce in the fridge. All of which became spring onion and tofu maki rolls for dinner last night. I dig hot chocolate. So much that I find reasons to have a couple of hours between connecting flights in Delhi. Just so I can hop into Choko La and have a cup of Papua Hot Chocolate. And sometimes I feel that I only go to London so I can go to the Chocolate Bar at Harrods. All because I can never get the right flavor when I make hot chocolate at home. Or didn't, until yesterday. This morning, I finally got it right. I always get excited about birthdays. And now in the blogging world, I have another birthday to look forward to apart from my own : blog birthday. My first blog birthday is still a few months away, but birthday celebrations are on at Aparna's diverse kitchen. She's asked for a special sweet something to bring to her party. Srivalli is back with another of her melas. After roti and curries, it's the turn of rice dishes! For her mela, I have the simplest rice dish in my repertoire. Chana Dal Khichdi, the easiest of comfort foods but also ceremonial. For this is the khichdi we make on bhai dooj, the first thing my brother eats after I put a tilak on his forhead to mark the occasion. When Sangeeth announced her Fight Diabetes event, I am sure she had in mind special foods for diabetics. I agree that special foods they have to be, with all the restrictions on what you can and can't eat. But having watched diabetes up close, I also know that anything that's too out of ordinary isn't going to cut any ice here. After all, diabetics have to follow a special diet the rest of their life. And if I grew up eating paranthas for breakfast, a fruit salad, no matter how nice, just isn't satisfying enough. When I think of food for diabetes, I think of things like besan parantha. While I have no medical facts to prove this, family lore has always told me that chickpeas - the small brown variety - help combat diabetes. So does besan or chickpea flour made from these. And this parantha in a version where it isn't fried and has minimal fats is a breakfast that would make my father happy. Without making him feel guilty! Here's the bhathura recipe I promised a couple of days back. Mix one cup plain flour with a tsp of cumin seeds, 1/2 tsp of ajwain (carom seeds) and a hearty pinch of salt. Add 1/2 cup yogurt and knead to a soft dough. You might need to add some water as well. Leave the dough in a warm place for 5-6 hours to ferment. If you live somewhere with a terrace, leave it out in the winter sun. If not, find the warmest place in the house for the dough to live till it swells. The dough will be very sticky by now, so put in the fridge for half an hour for the dough to firm up a bit. Take a lemon sized ball of dough and roll out thin. You can do this for the entire dough and keep the bhathuras covered while you heat oil to fry them in. ...you can't make great chhole. I am still a work in progress because mine never turn out half as good as mom's. This is her version. My contribution to the entire post was just standing there with a camera. There are two ways to make chhole. The traditional way is to figure out the right proportion of some twenty odd spices, grind them, etc. The easy way is to buy chhole masala. To make Punjabi chhole the easy way, soak a cup of chickpeas overnight. Boil them in plenty of water until soft with 1/2 tsp of salt and a tea bag thrown in to give chickpeas a brown color. Throw away the teabag and drain the chickpeas but retain the water they were boiled in. Greeen peas have to be the most versatile vegetable after potatoes. I eat them year round now that you can get them fresh not frozen. But late autumn and early winter is truly their season, when you get them at their freshest. Back at our home, you would notice peas pulao and matar paneer with increasing regularity around now. And by the time December rolls in, mom would be pairing peas with everything under the winter sun : carrots, cauliflower and if all else fails, potatoes to make aloo matar. This is our fail proof lunch : a tangy curry with two of the most favored vegetables that you can eat with either roti or rice. And what's the best part about making anything with peas? You can eat them raw while you were shelling them, they are that fresh right now! So start by shelling peas and if you have some left to make the vegetable, read on. We are having a Maharashtrian food festival at my home right now. It all starts every few months when my cook, who's a Maharashtrian herself, hands me a list of ingredients to buy because she's had an inspiration to cook something special. And ever since I tasted her sabudana khichdi and usal, it doesn't take a lot of motivation for me to go get coconut, kokam or whatever else she needs. The biggest motivation of all is her tomato saar. Saar has a soup like consistency and can be eaten on its own. But my cook insists that its a curry to be eaten with plain rice and it's my favorite way too. To make saar, drop 2 tomatoes in boiling water. Wait for a few minutes and remove. The skin should come off easily by now. Puree the peeled tomatoes. Mix 2-3 tbsp chopped or shredded coconut, a few cloves of garlic, 2 green chillies and 2 tbsp coriander leaves. Grind to a fine paste. No, it's not new year yet. 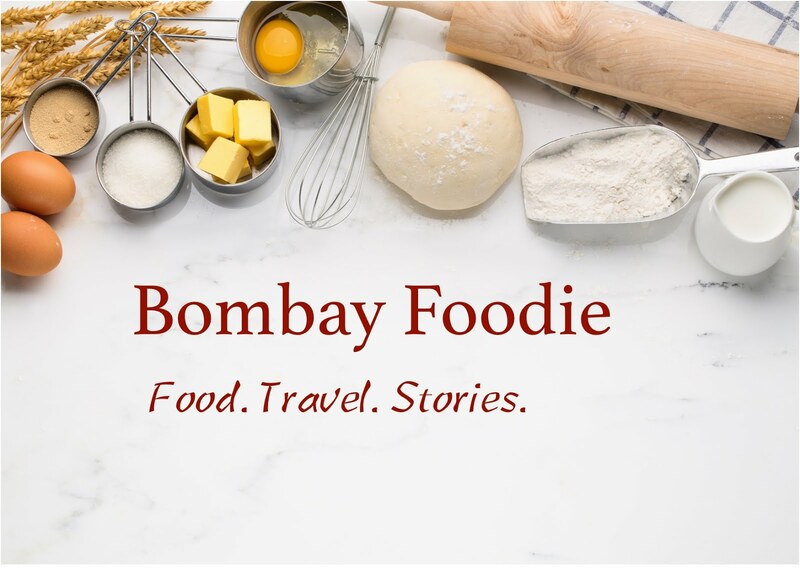 But this is Bombay Foodie's 100th post. I've come a long way in the past months, made a few starts. More importantly, I've made so many friends...lovely people who have stopped by with beautiful, encouraging comments and mails. 4. Delve into the alchemy of food. Create something, anything that qualifies as molecular gastronomy.